Home to Old Faithful Geyser, the Upper Geyser Basin Yellowstone National Park contains the highest concentration of geothermal features than in any other part of the park. Watch the famous Old Faithful Geyser erupt. Visit Black Sand and Biscuit Basins. 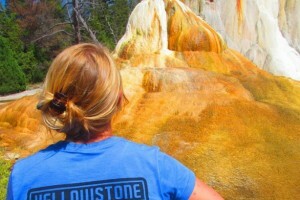 Hike to the top of Geyser Hill for great views overlooking Old Faithful. Visit via snowcoach or snowmobile in the winter and stay at the Old Faithful Snow Lodge. 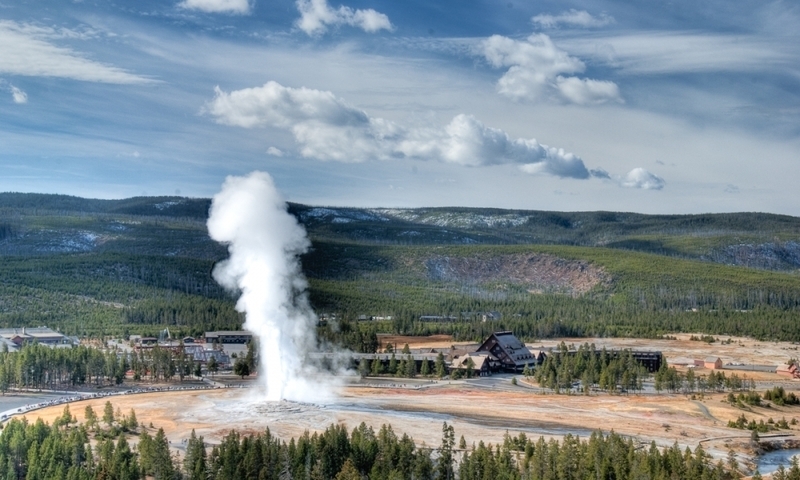 What can I do and see at the Upper Geyser Basin? Old Faithful Geyser: This is the reason everyone comes to Yellowstone. This predictable geyser erupts every 45-110 minutes and reaches heights of 180 feet. The next predicted eruption is posted in a number of locations around the geyser. Geyser Hill: On the northeast side of Old Faithful, follow a boardwalk trail around other features like Beehive and Plume Geysers. For great views, take the Observation Point trail to a wonderful lookout over Old Faithful. 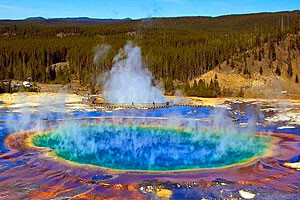 Castle Geyser to Morning Glory: From Geyser Hill continue north a boardwalk trail to Castle and Grand Geysers, and then further north to Morning Glory Pool. Black Sand Basin: Barely northwest of Old Faithful, stop by the Black Sand Basin, named after the commonly found obsidian rock. A few interesting features include Opalescent and Emerald Pools. Biscuit Basin: Head 3 miles north of Old Faithful to the boardwalk at Biscuit Basin and gaze into the Sapphire Pool before hiking out to Mystic Falls (2.5 miles round-trip). Hiking and Biking: Boardwalk trails, hiking trails, and bike friendly trails sprawl throughout the Upper Geyser Basin. From Old Faithful head up to Geyser Hill and then further north to Castle Geyser, Morning Glory Pool, and Biscuit Basin. 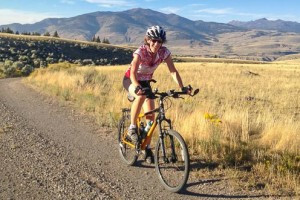 Bikes are allowed along paved pathways and up to the southern edge of Biscuit Basin. Bike rentals are available at Old Faithful. Winter Activities: During the winter months, join a snowcoach or snowmobiling tour to access the area. You can just do a day trip or stay the night at the Snow Lodge and enjoy other nearby winter activities including cross country skiing and snowshoeing. 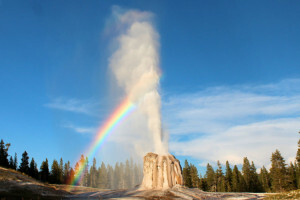 Lodging and Services: Other than a fantastic visitor education center, Old Faithful is like a small town, offering lodging at Old Faithful Lodge, Old Faithful Inn, Old Faithful Snow Lodge, a number of restaurants and cafes, gift shops, bike rentals, ranger programs, and much more. 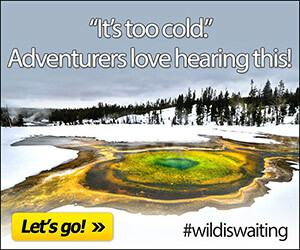 Where is the Upper Geyser Basin? Home to Old Faithful Geyser, the Upper Geyser Basin Yellowstone sits half way between Madison and West Thumb, along the southwest curve of the Park Loop Road. 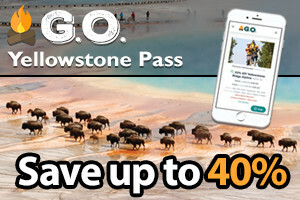 When can I visit the Upper Geyser Basin? You can visit Old Faithful and the Upper Geyser Basin with your own wheels anytime after the roads open in the spring to late fall. In the winter months, join a guided snowcoach or snowmobile tour to access the area and spend the night at Old Faithful Snow Lodge if you have time.